BECAUSE THIS GAME COULD HAVE BEEN SO **** GOOD!!!! Delete from your brain everything about the Sonic and Elise storyline, because it's hot stinking garbage. Delete the horrendous load times that ruin the flow so terribly that it's impossible to enjoy what this game has to offer. What's left? SUPER **** BADASS AWESOME ****, THAT'S WHAT!!!!! It's edgy in all the wonderful, glorious, perfect ways early 3D Sonic excels at. It doesn't do what Forces (i love u bby but) does where it tries to be edgy but then also backs up and is campy at the same time. Naw, Sonic the Hedgehog (2006) COMMITS. It takes itself all the way seriously and goes ALL in, friends. Shadow's story is straight up :fire emoji:. He's so badass and boy doesn't even NEED guns in this game to be Dark and Brooding but Also Overcome His Obstacles. "Should the world choose to become my enemy, I'll fight like I always have." BRO!!! GO OFF!!!!!! Eat **** Mephiles, Shadow the Edgehog gon beat you up in whatever **** timeline you show up, jerkwad. Then there's Silver and Blaze. NOT ONLY are they basically furry cell-saga DBZ fanfiction, which I am completely here for, but their story is P R I M E. TIME TRAVEL IS COOL, GUYS. Plot holes? Who **** cares, look at how COOL THIS **** IS!!!! They came back to the past to save their future and EVERYTHING IS ON FIRE. And Silver can LEVITATE ****!!!!!!! BRUH!!!!!!!!!!! BLAZE SETS **** ON FIRE!!!!!!!!!!! THIS IS SO COOL!!!!!!!!!!!!!! And then the arc ends in this angsty sacrifice in a parallel dimension that would be super sad if the game didn't just retcon itself out of existence at the end or whatever. SO GOOD. Like, if you just take the cutscenes pertaining to Silver and Shadow's stories, you have a super cool story that uses the cast of new and existing characters really well, doing them all justice, giving them each a unique role to play in the overarching plot, that's probably among the best storytelling in the entire Sonic franchise. Now, is Sonic known for its amazing stories? No. But given that most 3D games have stories anyway, it is FRESH AF to see something this C O O L for hecking once. But the problem is, then, they ruined everything because Sonic and Elise's story is the most miserable piece of hot garbage I've seen in my entire life. Sonic, mister titular "idgaf all I do is run around and be free and ****", spends the entire game rescuing Elise like 10 different **** times, Elise has no personality except that she's obsessed with Sonic, and then Sonic dies so Elise's plot tears can cause the final boss and then she macks on him and he comes back to life. I'M SORRY BUT WHAT THE HELL. Like, all you had to do to make this Not Terrible was make Elise 1. actually have a personality 2. like seriously, any personality is fine 3. NOT HAVE THE MOST CRINGEY SHOEHORNED-IN TERRIBLY WRITTEN '''ROMANCE''' WITH A CHARACTER WHO CARES ABOUT AS MUCH ABOUT ROMANCE AS I CARE ABOUT GOKU???? OF LITERALLY ALL THE CHARACTERS TO GIVE A ROMANTIC INTEREST, SONIC THE **** HEDGEHOG IS NOT ONE!!!!! DELETE THIS!!!!!! oh you already did, right, thanks. Now then; gameplay. Like.... I mean, we all know. It's glitchy as ****. 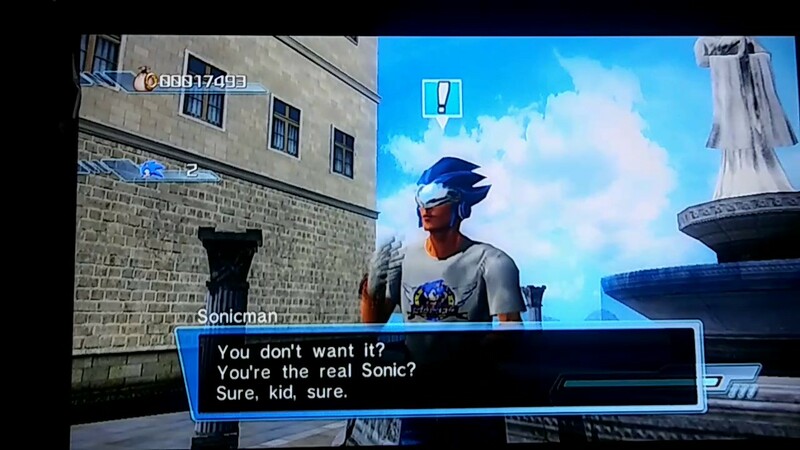 THEN AGAIN what 3D Sonic game isn't? The kicker is the HORRENDOUS LOAD TIMES. JUST!!! JUST LET ME GO 3 SECONDS WITHOUT HAVING TO WAIT ANOTEHR 10 SECONDS TO LOAD THE NEXT AREA!!!! I firmly believe that if this game was just SLIGHTLY less glitchy / more playable, but with ACTUALLY TOLERABLE LOAD TIMES, it would be infinitely better received gameplay-wise because even if it's jank the FLOW wouldn't be interrupted. The flow is what kills it. ANYWAY. I'M MAD!!! I'm mad because I GENUINELY LIKE SHADOW AND SILVER IN THIS GAME AND I LEGITIMATELY FIND THEIR STORIES TO BE SOME OF THE BEST WRITING IN SONIC THAT I CARE ABOUT THE MOST!!!!! But I can't say "I love the story in Sonic 06" because then people gonna think I stan that Son/Elise garbo when I really wish it would die. Like, if this game got a remake that re-wrote Sonic's story to be NOT **** AWFUL, fixed the load times, and made overall gameplay improvements, I legit think it would be one of the best games in the franchise. BUT WE WILL NEVER GET THAT BECAUSE POPULAR CONSCIOUSNESS HATES IT SO MUCH BECAUSE THE SONIC STORY AND LOAD TIMES AND JANK GAMEPLAY RUINED IT FOR EVERYONE. Y'all, this game had POTENTIAL!!! It had VISION!!!! It **** tried to go for something!!!!!!! Some of the better received titles, like Colors for instance, are overall better games but they aren't as INTERESTING to me because they are so SAFE. SONIC THE HEDGEHOG (2006) COULD HAVE BEEN A MASTERPIECE. AND I AM M A D A B O U T I T!!!!!!!!!!!!!!!!!!!! Partway through development Sega split the dev team in two and sent one team to work on a separate Sonic game for the Wii, thus leaving the Sonic '06 team understaffed. They also pressured the devs to push the game out in time for the holiday shopping season. Mid-Aughts SEGA is a fascinating beast, and Sonic ‘06 is one of its most interesting case studies. How do so many things go wrong behind the scenes to make this a release for your flagship franchise? That they deliberately ignored their playtesters' feedback to rush the release was perhaps the biggest mistake. I actually think Shadow is the star of this game. Team Dark are the only ones who don't get totally played, & Shadow himself immediately sees through Mephiles's crap throughout. Additional props for kicking Silver in the head. Anyway so glad Sonic Team learned their lesson from this game and has only produced fully fleshed out masterpieces since. Last edited by Apollo the Just on Sat Jan 19, 2019 1:37 pm, edited 2 times in total. It also gave us this. SEE??? What a good video game honestly. Just wanna say, it isn't actually a bad idea to give Sonic a love interest, they just did it wrong (presumably, i didnt play that sh*t lmao) because Amy Rose is the right way to do it. She's not a **** human and also it's basically one-sided since his interest and the focus of the games isn't on him getting a girlfriend. Just gives us an excuse to have a cute pink hedgehog who fawns over Sonic. I don’t consider Amy Sonic’s love interest; I DO consider Sonic to be Amy’s. What made 06 such a train wreck was Sonic going from giving 0 **** about romance to being down with an orange legged human making out with him. Honestly it’s not even that she’s human bc Shadow/Maria is a thing. It’s that she’s terribly written and so is Sonic in regards to her. I always pictured Shadow/Maria being a sibling-esque relationship rather than romantic.